Since the first Keeneland yearling sale back on August 9, 1943, the yearling sale—particularly Keeneland September—has been a benchmark for the North American Thoroughbred breeding industry. Similarly, the Dow Jones Industrial Average (DJIA) has been an important stock market index for almost 120 years. Looking at the past 15 years (1999-2013), these two averages have tracked similarly; the effects of the post-9/11 aftermath and the financial crisis of 2008 are clearly seen in declines in both markets. Since 2009 the growth of each market has been almost parallel. The yearling market is certainly more volatile than the DJIA. 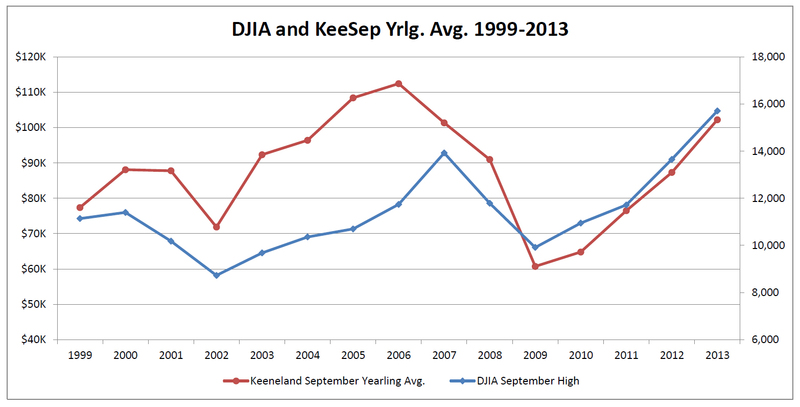 In 2002 the yearling average experienced a -18% change while the Dow moved -14%. In 2008 the sale's average plummeted -40%, the DJIA -29%. 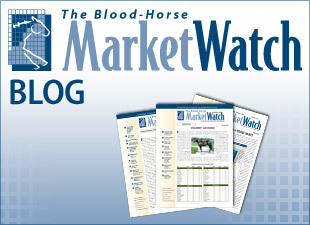 The more acute variations are likely a reflection of commercial Thoroughbreds largely being a luxury market and, therefore, are dependent on a thriving economy. It's no coincidence that as the DJIA is hitting record highs, the September sale is again breaching $100K+ averages, a threshold that had only been achieved three times previously (2005-07). 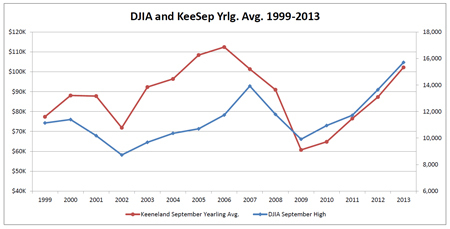 That being said, yearling prices aren't purely reactive to the stock market; while the DJIA reached its pre-2008 peak in 2007, the yearling market actually topped out a year earlier, when Danzig, Storm Cat, and Kingmambo each averaged more than $1 million at Keeneland September. No stallion has done that since.